Let me tell you about a movie which would have escaped from my radar if I haven’t moved to the UK. I’m a huge fan of British contemporary cinema but, sadly, I knew nothing about this film before going to see it. I actually saw it by accident – we got free tickets to the screening of it during the freshers week at my university. This is the luckiest accident I have ever had! 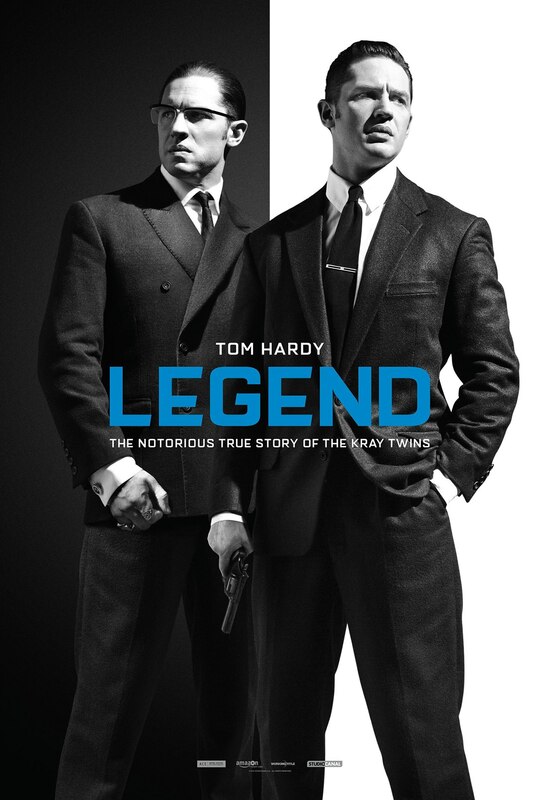 Story: Legend is a story of The Kray twins – notorious London criminals who terrorized the city in the 1960s. It’s based on real-life events which were recorded in a book The Profession of Violence by John Pearson. I’m currently reading this book because I loved the movie so much. I have never heard anything about The Kray twins but the story of their rise to power and ultimate fall from it was meant to be adapted to the silver screen and I’m so glad that it was. Both twins are played by Tom Hardy (Mad Max) who kills it in 2 very different roles. He definitely deserves at least an Oscar nomination for this film. I loved how he was able to bring comedic relief to the film as Ronnie and how conflicting of a character he made Reggie to be. I wanted to root for Reggie and felt bad for feeling this way and I always appreciate when films ignite an inner debate in my head and, in a way, confuse my thoughts. The supporting cast of this film was also amazing. Emily Browning shined as the love interest of Reggie and I especially loved the proposal scene. I hope she gets more good roles like this one because her previous work –The Host and Pompeii – does not really show what a great actress she is. Lastly, Browning looked amazing in 1960s fashion – one of my favorite fashion periods ever. Other stand-outs from supporting cast were Taron Egerton (Kingsman), who played one of Ronnie’s ‘boys’, Vision himself – Paul Bettany, and a former Doctor Who – Christopher Eccleston, who portrayed the detective who took down The Krays. The film was both written and directed by Academy Award winner Brian Helgeland. I have not seen his other films but loved the way he presented the story of The Krays on the screen as well as the way he realized the setting of urban London. The thing that I admire the most about British cinema is that it is not afraid to go overboard when it’s needed. American mainstream films are usually more toned down because they are focused on bringing the film to as wide audience as possible, so as to earn the biggest profit. British films are more blunt, gritty and are not afraid to say how it is or, in this way, show how it really is. I give highest praises to all the people who made this film. So, if you love British Cinema or want to see a great crime thriller from the villain’s perspective (or hero’s, whatever way you want to think about The Krays), go see this film. It’s been a month since I saw and I still cannot forget its story. Sadly, the film’s US release date has been pushed back to November, but it is definitely worth the wait.